The 40 Day Spiritual Workout! Since I relaunched my site through WordPress a couple months ago, the question people have asked most is, “What happened to the 35 Day Spiritual Workout?” Now, at long last, I can break the silence. 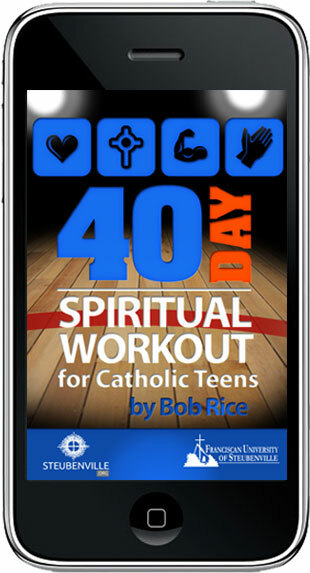 The 35 Day Workout has been transformed into… the 40 Day Spiritual Workout iPhone App! I am very proud of it. It was designed by FUZATI (who also designed the Steubenville Youth Conference app) and sponsored by Franciscan University. For those of you who don’t know, I first wrote “The 35 Day Spiritual Workout” in the late 90s as a follow up to the Steubenville Summer Youth Conferences. When I was a teen and attended a Young Life camp, my youth minister recommended a book called, “My First Thirty Quiet Times.” It was a thirty day devotional that got me into the habit of prayer. I thought that kind of devotional would be great for teens that had a powerful experience at a youth conference but didn’t know what to do when they got home. Since writing it, over ten thousand people have gone through it and have shared how much they were blessed by it. I was able to offer it for free on my website after the original publisher went out of business. This summer, the Steubenville Youth Conferences began to look into resources they could offer teens after their conference experience. They created a great website, steubenville.org, and an app to go along with it. I proposed that I could update the 35 Day devotional and they could turn it into an app. There are a lot of great things with the 40 Day Spiritual Workout App. First, because it’s an app it is a lot more interactive. My favorite thing is that a teen can put their youth minister’s email address in it so they can share with them (or their friends on Facebook) their progress in the workout. It looks really cool, too. But more important than how it looks is the content. I didn’t just add five days, I went over the whole thing based on feedback I’ve gotten over the past few years. I trimmed back some of the verses, removed days that weren’t as strong as the others, and added stories—many of the stories that I posted on the previous blog (such as my story about the pledge card or St. Reuben, the rich young man.) I also was able to incorporate the five forms of prayer that the Catechism talks about, something that was part of the published book but didn’t translate when I first put it on-line. But enough of me talking, why don’t you check it out? It’s available for free at the App Store. No iPhone? No problem. You can also click HERE and sign up to get each devotion through email. I’m hoping this will bless a new generation of teenagers. I’d be grateful if you could spread the word, and giving it a good review on the App Store might encourage a young person to download it and give it a try. Is this app focused only on teens? I have been a parent chaparone and wonder if it would be impact for adults as well. Yes, I think it’s actually good for teens and adults, but it was “created” for teens. But I don’t think it’s exclusive to them. This is AWESOME! Such a great tool to use for the youth. Its perfect timing for me, tonight is the first night for my 11th graders youth grp to meet haha. Thanks Bob, ill share this with them. God Bless! Can it be made into an App for the Droid too??? Unfortunately, not at this time. The Franciscan conferences did a poll of the teens and they overwhelmingly had an iOS device (iPhone, iTouch, iPad, etc.) instead of an Android one. But they are creating a mobile web device which can be read on any phone browser. Ever since I updated my software I’ve had trouble with the 40 day app. The text of the devotional is almost impossible to read. I tried deleting it and reinstalling it, but no change. So bummed ’cause I love this app! Thanks for the heads up… I’ll look into it. Glad you like the app so much! I’m seeing the same problem with readability. Changing the opacity of the text box, and probably also the font color should fix it quickly and easily. The app fix is in Apple’s cue for updates. Should happen any day now. I have a problem with color blindness and the text is impossible to read~ is there a way to change the text color? I wish! Right now, the text is illegible whether you are color blind or not. Something happened with the switch to iOS6 that made that occur. I’m told by the developers that they’ve fixed the problem and already been submitted to Apple, but there’s a long list of apps that are getting updated because of their new OS. Should happen any day now. Until then, try the “dumbbell” background as that seems to give the best contrast. That’s a lame suggestion, I know. Thanks for your patience. Great news! There’s a update in the App Store that should automatically load that mixes the bug. Thanks for your patience. I have updated and it works great! Thank You! I don’t have an iPhone and have tried to subscribe via the email link but keep getting an error message … is there a problem with the web sites or am I just experiencing my own technical difficulty. Thanks. I’ve sent your message to the tech guys and they should be getting back to you. Let me know when it gets resolved. Thanks for your patience! Pingback: 46 Things to do for Lent! | Cloudy with a chance of Catholic. Hi Bob, i know there’s paperback and i dont have a kindle, but is it possible for me to purchase a PDF version of this for my laptop? Hmmm. Well, the best thing to do is to download the free Kindle app for your computer, then download it from there. I’m not sure how else to get it to you. Will that work? How and when can we get it on an android ? The link to sign up for daily emails is not working. Can you please fix quickly?? My confirmation class is using the app/emails as an assignment. Thank you! Neither the app or the link are working for me. I think the app isn’t compatible with iOS 11 and needs to be updated. I tried the link across multiple platforms and it didn’t work. If you could please check on these, that would be great! I’m really excited to start the spiritual workout. Thanks! Please make an app for Android!! I love this book but would really like to use the app. Thanks! !